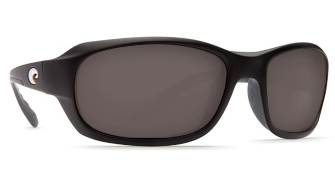 It’s been over a year since we first tried on a pair of Costa Del Mar Tag sunglasses, and we have yet to find another pair of shades that are better suited for a day of activity. From a day on the boat, to a day at the beach, if we know we’re going to be spending a full day being active in the sun, the Tags are the glasses we grab every single time. Below, you will find our original post on these fantastic sunglasses, it ran on May 28, 2011. 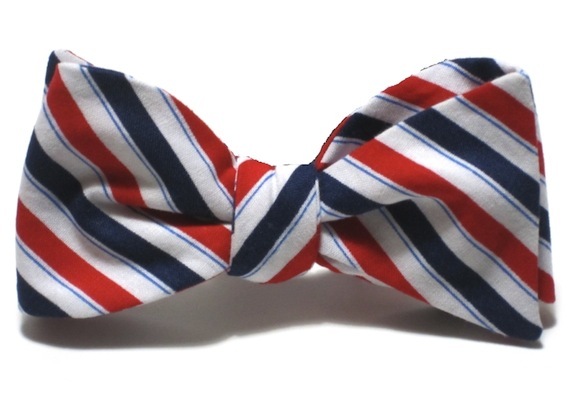 Independence Beau by Starboard Clothing Co.
It’s the last Bowtie Friday before one of our favorite holidays, the 4th of July. While we can appreciate all of the stars and stripes bows that have hit the market as of late, we feel like those are relegated to only a few wears a year, and we prefer something a bit more versatile. That being said, we’re absolutely going to be representing the red white and blue on the 4th with this week’s pick, the Independence Beau ($45) from Starboard Clothing Co.
We always seem to work a good bit of red, white, and blue into our everyday wardrobe choices, but this time of year it seems that without even realizing it we look a little extra patriotic. One part of our wardrobe that seems to be lacking when it comes to patriotic colors is our shoe collection, but, if things go according to plan that will be changing quite soon. We’ve been eyeing them for a while, and it is just about time that we pull the trigger on a pair of Navy Boatshoes ($252) from our friends at Oak Street Bootmakers. Whenever we are on the water we make sure to use some sort of sunglasses retainer, and, for the most part, we use them even when our plans don’t involve H2O. Our friends aren’t quite as diligent, and at least twice a summer someone ends up “donating” a pair of sunglasses to the river, bay, or ocean. There are a ton of great options out there to keep your sunglasses secure, but one company has managed to set themselves apart from the crowd with their seersucker and gingham “Sunglass Complements.” ($14) That company is Tugs, and in an effort to save some helpless sunglasses from an untimely demise, we’re happy to announce that they are going send one of their signature products to a lucky Bows & Boats reader. It’s no secret that we are huge fans of Bonobos. With an ever growing collection of great pieces, and customer service that is second to none, we were really excited when we realized we were going to be able to squeeze in a visit to their NYC showroom last week. If you ever plan on visiting NYC, we’d highly recommend booking a session with the Bonobos guides, they’ll walk you through everything in the lineup piece by piece and can answer just about any question you might have. 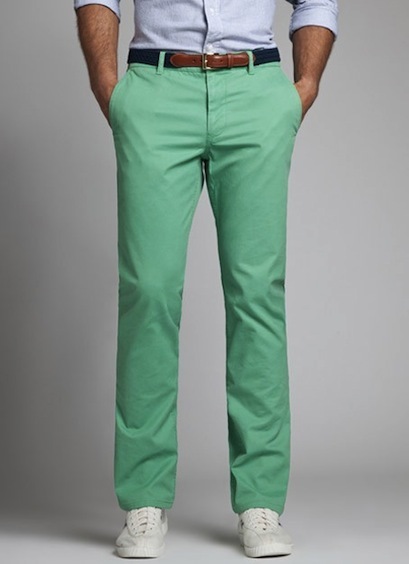 One thing that we were pleased to see in person were they recently released Lawn Rangers ($88). In fact, we ordered a pair as soon as we got home. Early last year, our friend Nick over at Knot Clothing & Belt Co. introduced us to a product that was unlike any other we had ever seen on the market. In a market flooded with options, the brother and sister team that make up Harding-Lane had managed to carve out a niche nobody else had explored. 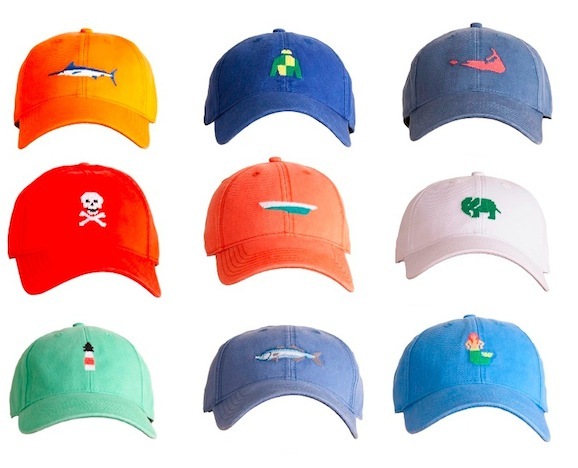 That niche was hats with needlepoint details, and we are happy to announce that, with their second wave of designs about to hit the market, Harding-Lane is going to be giving away one of their needlepoint hats ($30) to a lucky Bows & Boats reader. Though you’ll find us in a collar far more often than not, there are days that there is no better choice than a simple t-shirt. Whether your taking care of a to do list, dropping a few lines in the water, or simply doing nothing, you can’t beat the comfort of a classic pocket-t. 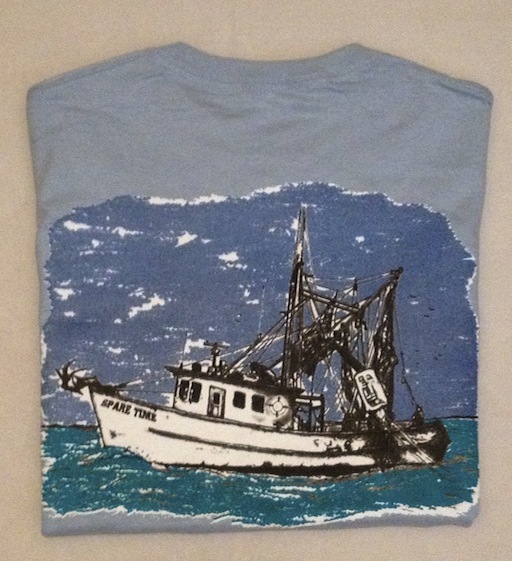 Recently, our friends at Gulf Shore sent up a pair of their “Spare Time” Shrimp Boat tees ($26.50) for us to check out. It has been simply fantastic to see the great use of chambray this season. From shorts, to blazers, to bowties, everyone is stepping up their chambray game, and we really appreciate it. If you’re still a bit leery of wearing chambray in something other than shirt form, this week’s Bowtie Friday pick might be the perfect way to test the waters in the ever growing sea of chambray options. 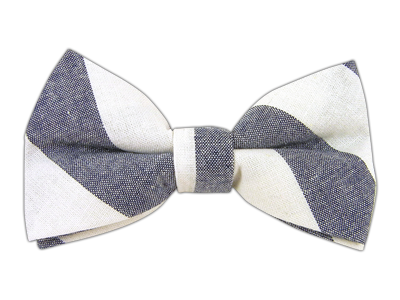 Our pick this week is the Chunk Chambray Stripe Bow ($15) from The Tie Bar. As much as we have been championing the rolled up sleeves look this summer, there comes a time when you have to buckle and give in to the notion that short sleeves are just a better option. We were hit with that realization yesterday when temperatures approached triple digits for the first time this year. Luckily, there are a number of great polo options hitting the market this summer. 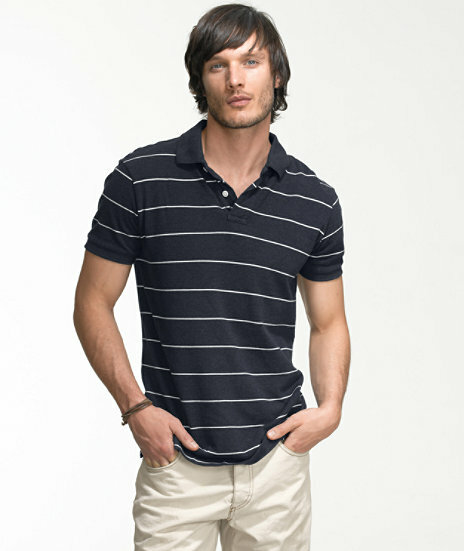 One of our favorites is the Striped Saltwash Pique Polo ($45) from L.L. Bean Signature. Leather Tabbed “Oh My Stars” belt by Knot Clothing & Belt Co. Image: Knot Clothing & Belt Co.
With the 4th of July only a couple of weeks away, it seems like we are seeing American flags pop up on virtually everything. While tens of thousands will be flaunting their $5 flag shirts from a well known chain store, we like to keep things a bit more low key (side note: if you find yourself bored at an outdoor event the week of the 4th, count how many of them you see, you’ll be amazed). A low key approach not only fits our style, it also ensures that our patriotic wear will also be able to transition seamlessly into our wardrobe on non-holidays. 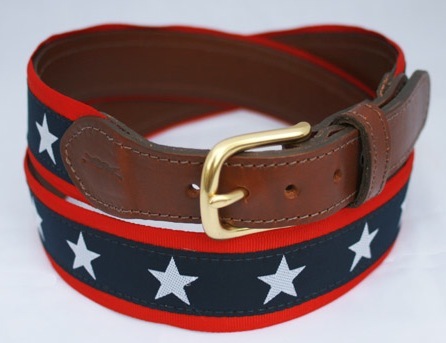 This year, our patriotic belt of choice is the Leather Tabbed “Oh My Stars” belt ($96) from Knot Clothing & Belt Co.